Two souls play as one, Ive kinda entitled this. 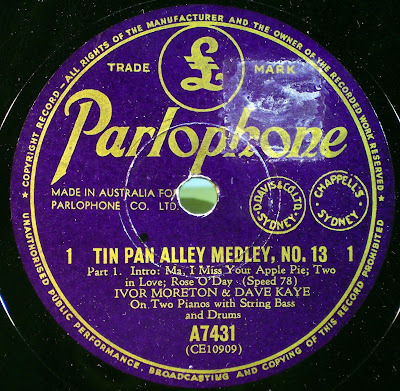 British players of twin pianos from the lat 30's early 40's. 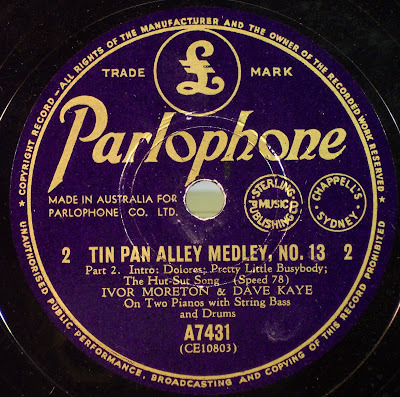 Ivor Morton & Dave Kaye - Tin Pan 13 Side 1 "Good"
Ivor Morton & Dave Kaye - Tin Pan 13 Side 1 "Too Much Noise Reduction"
Ivor Morton & Dave Kaye - Tin Pan 13 Side 1 "Fake Stereo"
Ivor Morton & Dave Kaye - Tin Pan 13 Side 2 "Good"
Ivor Morton & Dave Kaye - Tin Pan 13 Side 2 "Too Much Noise Reduction"
Ivor Morton & Dave Kaye - Tin Pan 13 Side 2 "Fake Stereo"